BioRemove 5900 is a fasting-acting biological formulation of denitrifying microorganisms that work in a wide range of municipal and industrial wastewater treatment processes to improve denitrification efficiency and stability. Conventional biological nitrogen removal requires two processes: nitrification and denitrification. Nitrification is the conversion of ammonia to nitrate. Denitrification is the conversion of nitrate to nitrogen gas. 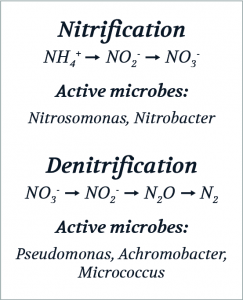 Biological nitrogen removal requires an aerobic zone for converting ammonia to nitrate and an anoxic zone for converting nitrate to nitrogen gas. Why is BioRemove® 5900 unique? The microorganisms in BioRemove® 5900 complete the nitrogen cycle to improve total nitrogen reduction. What type of C sources does BioRemove® 5900 use? BioRemove® 5900 has a broad range of carbon utilization, including acetic acid, glycerin, and glucose. How is dosing determined for BioRemove® 5900? Dosing for BioRemove® 5900 takes into account wastewater flow and total nitrogen loading. Please contact Maryland Biochemical for dosing tables and questions about dosing. What are the operating conditions (temp, pH, DO, mixing) for optimal results? For best performance in terms of nitrate and nitrite removal, an anoxic environment (low DO) must be maintained. Anoxic basins should be maintained with ORPs less than +50 mV but greater than -200 mV. BioRemove® 5900 functions well between 10°C and 40°C. BioRemove® 5900 microorganisms are facultative, which means they can also function in aerobic environments.